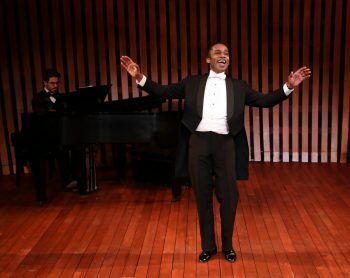 While Roland Hayes is well known and highly admired in the world of classical music, it is surprising and regretful that he is not better known by the general public. His story of determination, talent, and belief in himself is inspiring to say the least. In a time when we are sorely lacking in role models, you won’t go wrong looking back to Roland Hayes as an example of how to live one’s life. 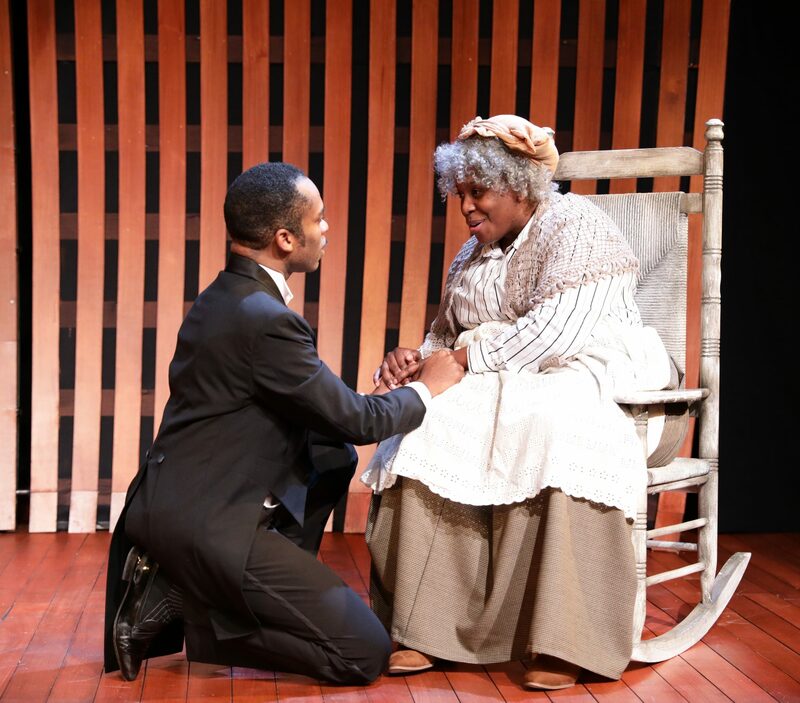 Breath & Imagination now playing at the Lyric Stage in Boston brings us his story and music. I hope it also makes more people aware of this very important man who spent much of his life living in Brookline, MA while also teaching and performing in Boston. Davron S. Monroe plays Mr. Hayes in this 90 minute production that is filled with music both spiritual and classical. The cast is small and the play is intimate with Mr. Monroe being accompanied by Asher Denburg on the piano. Mr. Denburg is also the Music Director. Doug Gerber plays Mr. Calhoun, Roland Hayes’s first voice teacher. 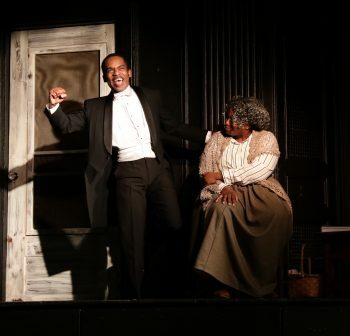 Nile Scott Hawver takes on a number of other parts that include Miss Robinson, a voice teacher, as well as the King of England. 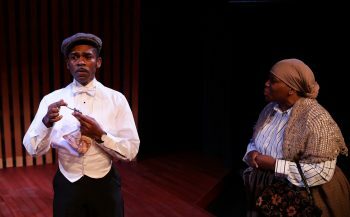 The play revolves around the relationship between Hayes and his mother Angel Mo played by Yewande Odetoyinbo. Roland’s father died when he was young, but we learn from his off stage voice (Nile Scott Hawver) how he influenced his son by talking him for walks in the woods while teaching him how to listen for the sounds of nature and to try to mimic them. This is where the young Hayes first became enthralled with what he could do with his voice. Angel Mo encouraged him to develop his voice hoping he would use this “gift from God” to become a preacher. Roland had other ideas. After hearing a recording of Enrico Caruso, the young man wanted to became a classical singer. This put him at odds with his mother. Watching the story unfold, while both Mr. Monroe and Ms Odetoyinbo fill the theatre with their beautiful voices,touched my heart. Both actors play their characters over the course of many years, and the transition from youth to old age is flawless. Roland Hayes was the grandson of slaves. He was stepping into a world that was not exactly welcoming to African Americans. At times he became discouraged. At one point he wanted to quit. In a moving scene he sings “Were You There When They Crucified My Lord”. It is here, when Hayes wants to pack it all in that Angle Mo says to him “Things being hard don’t give you the right to give up”. It’s tempting to call this “tough love’, but it’s not tough, rather it is a strong and loving mother who believes in her son and knows he can succeed. He may not be fulfilling her wish of becoming a preacher, but he is using his God given gift to do much good. It is scenes like this that make this play so inspiring. Breath & Imagination is not a detailed account of the life of Roland Hayes. What it does is give us good overview of his struggles, his doubts, his steadfastness, and his belief in himself. There were many times when that belief was shaken, but this was Angel Mo’s son, and he was not going to give up. 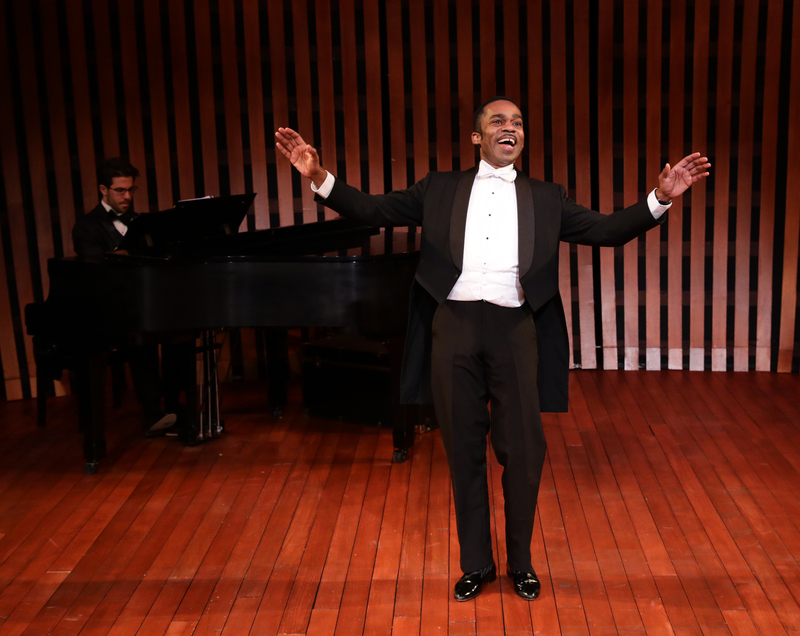 The music that fills the Lyric Stage Theater is very special. 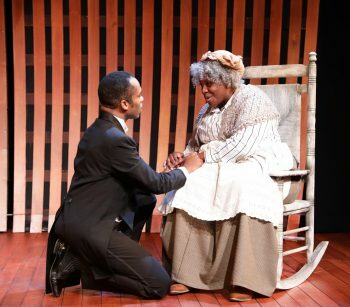 Ms Odetoyinbo and Mr. Monroe are both excellent actors, and they are actors who can sing, and sing magnificently. I was deeply moved by both of them, as I was by this production. Listening to Angel Mo, as her days are winding down, singing “When I’m Gone” is both sad and joyful. Ms Odetoyinbo was very impressive. She is young but you would swear she has been at this for decades. She plays a very strong woman in Angel Mo while giving her character the deeply loving heart that makes us wish we all had an Angel Mo in our lives. The lucky ones do. Davron S. Monroe was last seen at the Lyric in The Wiz. After seeing him in Breath & Imagination, I can’t sing his praises high enough. From the spirituals to the magnificent classical pieces, his voice comes to us from deep within his heart. In the time of Roland Hayes people were denied the opportunity to develop their talents all because of the color of their skin. Roland Hayes played a big part in changing that when it came to music. Mr. Monroe honors his great legacy by lending his talent to tell us that story. He also gives us the joy of music along with the lessons to be learned from this great man’s life. Breath & Imagination is a must see. It will move you and I certainly hope it will bring the life of Roland Hayes to more people. The Lyric Stage is filled with music and love, take part in it.